On this page I will post reviews, comments and articles specifically relating to my new book, released May 2013, The Sleeping Baobab Tree. Many thanks to all of the reviewers who have taken the time to read and review the book. Finally, with Paula Leyden’s The Sleeping Baobab Tree , we travel to Zambia for a mind-opening novel featuring twin sisters, the boy next door and his formidable great grandmother: a car journey involving all four provides a wonderfully sustained piece of comic writing in a novel that nevertheless engages with serious contemporary themes. Thank you Jane Mitchell, award winning author of too many books to mention – but take a look at her website here. A lovely review from such a talented writer. And I am delighted that like Bwalya she recommends the book for all ages. Paula Leyden’s second book, The Sleeping Baobab Tree, is an evocative and magical journey into the soul of rural Zambia. Although not a sequel, the book features the same cast of characters from her first novel (The Butterfly Heart). Told in turn by twins Bul-Boo and Madillo, and their friend Fred, the story explores themes of loyalty, friendship and trust. Sister Leonisa, the children’s teacher, has a morbid fascination with death and tells the children wild and gruesome tales. Her interactions in class with the skeptical and eager Bul-Boo are humorous, while dreamy Madillo is intrigued by the stories as she believes in magic and spells. In contrast to the twins, Fred is somber and gloomy, serious beyond his years and burdened with a gift for premonition. Paula Leyden is skilled at character development and setting, evidenced in her first novel and further demonstrated in The Sleeping Baobab Tree. It was easy for this reader to imagine herself in Zambia, in the company of the children. Zambian traditions and contemporary realities are effortlessly interwoven throughout, demonstrating how the two co-exist in the African country. A sub-plot looking at the treatment and acceptance (or not) of people with AIDS adds political tension and a deeper resonance to the novel, as Bul-Boo tries to unravel the mystery of AIDS patients who are disappearing and dying. 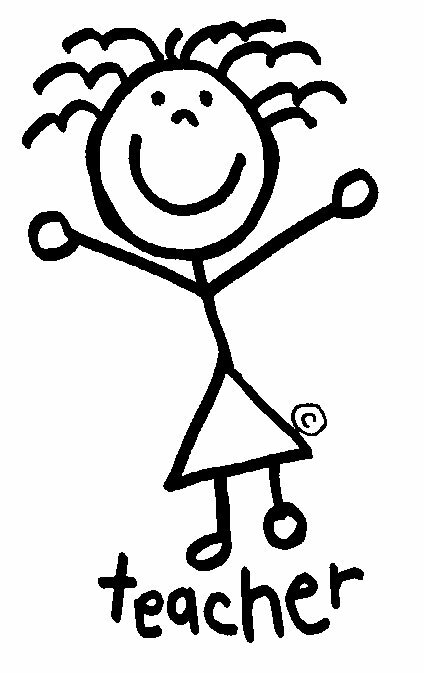 Paula successfully uses opportunities for humour to lighten what might otherwise be a dark tale for children. This is a recommended read for all ages. It is endorsed by Amnesty International as contributing to a better understanding of human rights and the values that underpin them. A great review from Bwalya Chileya on her website Miss Bwalya Writes. I love that she recommends it as a book for all ages! 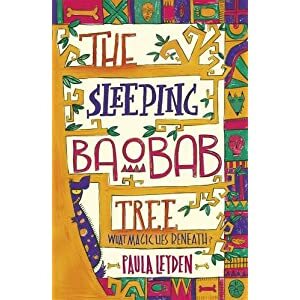 The Sleeping Baobab Tree is the second book by Paula Leyden which follows the adventures of siblings Bul-Boo and Madillo, and their friends. As in the first book, A Butterfly Heart, the story is set in Zambia and is told from the children’s points of view. This is not a sequel but rather stand-alone book, as explained by the author. Bul-Boo and Madillo are twin sisters, and classmates and friends with their neighbour Fred. As the story opens the children are introduced to Ng’ombe Ilede “The Place of the Sleeping Cow: the place of death.” Sister Leonisa, the religion teacher, has a morbid fascination with grim stories, the story of Ng’ombe Ilede notwithstanding. She has a flair for exaggeration and does not brook any arguments from increasingly skeptical students. Bul-Boo is one of the skeptical students who often challenges the facts in Sister Leonisa’s wild stories, and the interactions between the two are comical. Madillo on the other hand believes in magic and spells, and is intrigued by the stories. Fred has a gift which he describes as a curse. He has premonitions and as a result has a foreboding nature and takes things too seriously for someone so young an age. At home as the children are processing Sister Leonisa’s latest story, Fred is informed by his great-grandmother Nokokulu that she’s travelling to Ng’ombe Ilede, and he’s going with her. Nokokulu is a witch, and this journey is one she’s undertaking to do battle with someone she calls Man-Beast. Fred, unable to dissuade Nokokulu and knowing his parents will be just as unsuccessful, resigns himself to his fate; the unaccountable sense of foreboding he woke up with that morning ticks up a few notches. Next door Bul-Boo overhears her parents discussing the mysterious disappearance of patients from their mother’s HIV clinic; one of whom is Fred’s beloved aunt Kiki. She shares this news with Madillo, who lets her imagine run wild and speculates the patients have been taken by a wizard much to Bul-Boo’s chagrin. What follows is Bul-Boo and Madillo trying to unravel the mystery of the missing patients, and a wild trip to Ng’ombe Ilede with Nokokulu. Will Fred’s sense of foreboding come true on this trip and was Sister Leonisa’s right about the mystical things that happen in the place of death? It was thoroughly enjoyable to join the twins and Fred on this adventure in The Sleeping Baobab Tree. Leyden does a remarkable job telling the story from the children’s points of view. Each of the three children moves the story along from his or her perspective, and the reader is privy to their individual thoughts and anxieties. An unexpected joy was the character of Nokokulu. Though a self-confessed and powerful witch she is not at all a caricature whose presence in the book is to terrify children and fit the mould of “evil, old woman.” Instead, she’s the matriarch of Fred’s family, and takes her role as a defender and keeper of tradition quite seriously. She knows Fred has a gift and is grooming him as her heir, despite his misgivings and desire to be a regular child. Leyden is particularly skilled at descriptive text. The people and places she writes about allow the reader to feel part of the story and believe they are there with the characters. The dualities of contemporary and traditional customs are also well done. It is not at all preachy about the old ways being archaic, instead the reader is presented with the reality that exists in many African countries – the two co-exist, informing our past and present. Once again Leyden has proven her skill at taking concepts that would otherwise be dark and burdensome for children (her target audience), and made it a lively adventure, all the while inserting lessons about history, friendship and loyalty. This is a recommended read for all ages. If you have a chance to read the preceding book, A Butterfly Heart, do so. You will not be disappointed. *Ng’ombe Ilede is one of the most important archeological sites in Zambia. It was discovered in 1960 during civil engineering works. It is an Iron Age prehistoric site on the highest point of a ridge of the same name, on the left bank of the Lusitu River, a tributary of the Zambezi River in southern Zambia. The site was first settled between the late seventh and the late tenth centuries, then abandoned and reset­tled in the early fifteenth century. Most of the graves and their goods date to the fifteenth century. More information here. From Mary Esther Judy on her blog Fallen Star Stories in an article entitled Great Summer reads .. thank you Mary! From Jenny Crwys-Williams, Radio 702, Jo’burg. An interview with Wayne Simango of Parkhurst Primary. Thanks so much Wayne for your interview and follow up review. Great work. Thanks Jenny and Wayne for this. A podcast which can be found here – the review starts at 7 min 30 secs approx. I enjoyed reading this book, I was intrigued by the plot of the story and the fact that it takes place in Zambia a country in africa and all the details are quite relevant to the world we live in today it is very informative and it raises issues such as aids and the consequences of aids such as aids orphans. Bul-boo and Madilo are twin sisters who go on an adventure with Fred their best friend and his crazy witch granny to defeat the dreadful manbeast. It would have been nice to see illustrations it was a lovely read and I recomend it. Thanks Mo, a wonderful endorsement! Admirers of Paula Leyden’s prizewinning first novel, The Butterfly Heart, will enthusiastically return to Zambia in The Sleeping Baobab Tree (Walker, £5.99). Bul-Boo is the scientific protagonist while her twin sister, Madillo, is more attuned to the traditional beliefs of Nokokulu, the eccentric great-grandmother of young Fred, next door. Nokokulu takes Fred to the Place of Death, and the twins hide in the car boot. The journey coincides with the mysterious disappearance of local people, including Fred’s aunt, who suffer from Aids. What really happened during that terrifying night at the burial ground? The children’s shadowy memories of a two-legged hyena defy rational explanation. Underlying the strangely captivating adventures is a deadly serious modern story of Aids sufferers’ vulnerability when tradition and modernity coincide. Leyden is a born storyteller. Thanks Maeve, appreciate you taking the time out of your Panamanian adventure to do this! 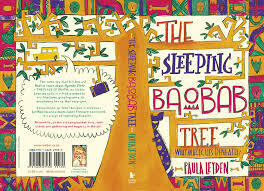 The Sleeping Baobab Tree is the second novel by Paula Leyden, winner of the Eilis Dillon Award for her debut novel, The Butterfly Heart, which introduced us to the twin sisters, Bul-Boo and Madillo and tackled sensitively and originally the issue of forced child marriage. In her new book we are once again in Zambia, where Paula Leyden spent her childhood: her love for its landscape, culture and people shines through in her lyrical writing and startling imagery. Sister Leonisa, the twins’ eccentric teacher, tells them about a place called Ng’ombe Ilede which is crawling with ghosts including that of a child called Bukuko whose grave lies near the tree called the Sleeping Cow. On the very same day, their best friend, Fred, a boy cursed with the gift of seeing doom and tragedy everywhere, is told by his (maybe) witch great-grandmother that she is taking him, as the inheritor of her magical powers, on a trip to the very same Ng’ombe Ilede to visit the bones of their ancient forebears and confront the Man-Beast. The girls decide to stow away in granny’s car and accompany Fred. Meanwhile, we have also learned that the twins’ doctor parents are concerned about the disappearance of several of their patients from the AIDS clinic where they were being treated. One of the disappeared is Fred’s beloved Aunt Kiki and Bul-boo fears it has something to do with unscrupulous charlatans selling false promises. The stage is set for a novel that combines superstition and magic, science and logic, secrets and discoveries. The story is told in alternate chapters by Bul-boo who keeps a notebook and likes everything to be scientifically proven and by Fred, who is more traditional and rather fearful – but who wouldn’t be, given his powers of prediction, and a frankly crazy granny? The three children come zingingly to life, timeless and contemporary at the same time, on the brink of growing up, always funny but sometimes perplexed by the adults around them. I thoroughly recommend The Sleeping Baobab Tree – you will be seduced by its story-telling and by the spirit of Zambia. Bul-boo and Madillo, twin sisters, live with their parents in Zambia. Fred is their next-door neighbour and friend who lives with his great-granny Nokokulu whom they suspect of being a witch. One day, Nokokulu asks Fred to accompany her to Ng’ombe Ilde, The Place of Death, near the confluence of the Zambezi and Kafue rivers to see the sleeping Baobab tree. Why has she brought him there and is the legend of the two-legged hyena who roams Ng’ombe Ilde true? This is a very engaging and well written story, told in turn by Bul-boo, Madillo and Fred. The voices of each of the three narrators are distinct and well developed. The narration is gripping. Tension gradually builds up as the children make for Ng’ombe Ilde (which translated literally means The Sleeping Cow), where in the 14th century a few people were buried wearing ornaments of seashells and exotic glass beads. Themes of friendship, loyalty and family are effectively explored in this story as well as questions and issues such as the rights of the individual, illness, religion, AIDS and deceit. The descriptions of the Zambian landscape are vivid and evocative, and will last in the memory of the reader long after they have finished reading. The story deliberately does not answer all the questions which it raises, but rather leaves the reader to ponder. This book would be an excellent resource in a classroom as a catalyst for discussions on human rights, interculturalism and equality. For Boys and Girls aged 9 – 12.
Review by Mary Esther Judy on BookBag UK and Fallen Star Stories. Sister Leonisa is always telling her students grim and gruesome stories. One day, she tells them all about Ng’ombe Ilede… the place of the sleeping cow; the place of death. As Bul-boo and Madillo arrive home filled with her horror stories, next-door neighbour Fred (himself always full of tales of woe) informs them he is to go to that very spot with his fearsome witch great-granny, Nokokulu. Also, that night they learn that patients from their mothers’ AIDS clinic are mysteriously vanishing; one of the vanished just happens to be Fred’s wonderful Aunt Kiki. Is all of this a strange coincidence or fate? With Bul-boo and Madillo stowing away in the boot of the car, Nokokulu drives a doom-laden Fred out into the Zambian wilds for an encounter with mystery and magic the three will never forget. At the sleeping baobab tree, anything could happen. It is such a joy to return to the lives of Bul-boo and her twin Madillo in the butterfly heart of Africa. Leyden’s descriptive text gives full texture to the place, the people and the beliefs of Zambia with a strength that allows the reader to believe they are there. While Bul-boo and Madillo again provide a sense of the duality of human nature; the pragmatic meeting the superstitious; this story primarily belongs to Fred, who struggles with his inbuilt sense of impending disaster at every turn. The relationship between the three friends provides a strong, yet easy dialogue with the aspects of loyalty, mystery, common sense and confusion that make up their emerging world-view. Add to this the frightening and yet stabilising character of Nokokulu, a symbol of roots and tradition as strong as the ancient Sleeping Baobab Tree, and we have an impressive dialogue with a social structure in conflict with itself; which of the old way to keep and which to throw away; how to move fully into the contemporary world and remain who we truly are; a quality that allows the story to easily relate wherever the reader may live. It may seem that these are heavy, burdensome concepts for young readers to take on, but not at all. The story is not weighed down by messages or agendas. It is adventurous, mysterious and humourous. The friendships are tangible. The characters are identifiable and become easily lodged in the readers’ hearts and memories. The situations in which the friends find themselves are believable and are depicted from a child’s-eye view that never speaks down to the reader, but leads them through a wondrous and heart-felt journey. As with Leyden’s first book ‘The Sleeping Baobab Tree’ is simply beautiful, and an absolute joy; a rare and wonderful gift. 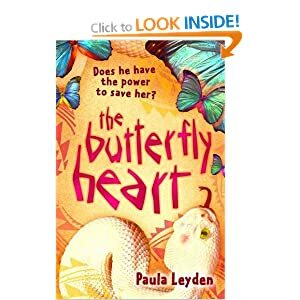 If you haven’t read The Butterfly Heart by Paula Leyden yet, please, please do so immediately… such a wonderful book! This is only the second book by Paula Leyden and is a punchy and beautiful story worthy of a well seasoned writer. Leyden won the prestigious Eilis Dillon Award for her début The Butterfly Heart. Despite The Sleeping Baobab Tree being set in a country that I know little about – this story has a universal theme. We have twins who see the reality of illness thorough their medical parents, and Fred; who is destined to be a leader, even with a name like Fred!The twins decide that they will help their best friend, Fred, when he is asked to go and beat The Man Beast with his cranky witch great grandmother. This is a dual plot, we’re treated to the children’s story of the journey to The Sleeping Baobab Tree and the missing aunt story line.Each of the three characters were used for POV and I loved how Bul-Boo was into science and kept a notebook. Her twin, Madillo believes in magic and spells. The sisters are so different.I loved the character of Sister Leonisa so much that I’d love a book all about her and her classroom! Leyden did a fantastic job of forecasting with this character.This is a book that adults would love, it’s well written and paints an intriguing picture of Zambia. All ages will love The Sleeping Baobab Tree for its powerful story telling.Thank you to Walker Press for the review copy, another treasure to be added to my library.For the teachers out there, here is the teachers guide. 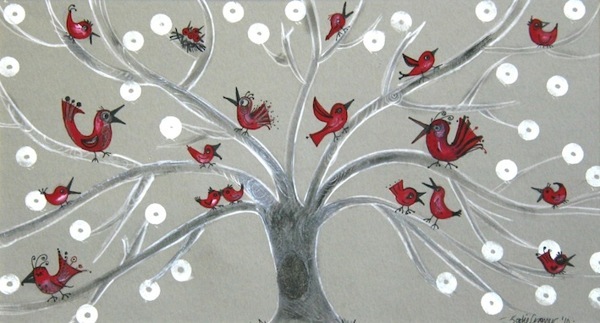 Review by the wonderfully talented artist, illustrator, writer and sculptor Sadie Cramer. Thank you Sadie! There’s always a worry that the sequel to a very successful award-winning book will be formulaic or a shadow of its predecessor. Not so, The Sleeping Baobab Tree. We re-visit some of the key characters from Leyden’s first novel The Butterfly Heart: twin sisters Madillo and Bul-Boo, Sister Leonisa, Fred and Fred’s ecccentric Great- Granny Nokokulu and what results is a captivating, compelling story which grips the reader until the final page. The deftly woven narrative takes us on an emotional journey interjected with plenty of humour. Endorsed by Amnesty International, The Butterfly Heart centred on the issue of child marriage. The Sleeping Baobab Tree has also been endorsed by Amnesty, this time for highlighting the right to medical help, to enjoy our own culture, and to freedom of belief and expression. Once again, Leyden manages to sweep us off our feet and transport us to an African landscape which fills the senses and enriches the heart. If you haven’t read either book, treat yourself to both and read them one after the other. You won’t be disappointed! Thank you for posing my review here. I really enjoy your book and I’m already looking forward to reading your next one.